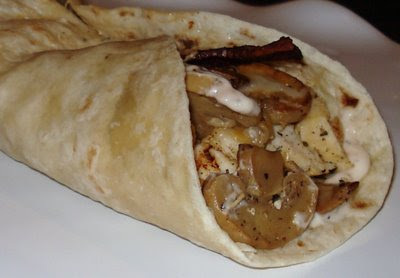 I had some leftover chicken after the bbq chicken pizza and came up with these yummy wraps to use it up. Hope you enjoy! Wrap the tortillas in tin foil and heat in a 200 degree oven till warm. Add the onions, garlic and mushrooms and season with pepper (and salt if desired, but not necessary). Saute over medium heat for a few minutes, until the vegetables are tender. Add the cooked chicken breast to the pan and cook just a couple of minutes more till the chicken is heated. Meanwhile, combine all of the ingredients for the herbed mayo in a small bowl. (I used Hellman's light mayo and Texas Pete Hot Sauce). Remove the tortillas from the oven and spread each tortilla with about 1 tablespoon of the herbed mayo. Top each with 1/4 of the chicken mixture, 2 slices cooked bacon and about 2 teaspoons of the cheddar. Then roll up the tortillas and serve. *Using leftover cooked chicken saves time, but you could use raw chicken if desired, just make sure to season and cook it with the veggies until it is cooked through. Calories per wrap: about 350, not counting the veggies. For future and past reference I never count veggies in the calorie total unless they are high calorie vegetables, like corn for example.